Let’s face it – technology isn’t always superior. Debit card and credit card machines go down from time-to-time, cards get demagnetized, stolen and can give one a false sense of financial security. While some may think of cheque as being old fashioned – after all, it has been a mainstay method of payment for centuries – there are many good reasons they’re still around today. In fact, they date all the way back to the 9th century – back then, merchants relied on cheques to exchange funds, according to the Economic Review. And for much of the 20th century, they were the most widely used method of payment. Whether it’s paying for groceries at the supermarket or paying for childcare, to gifting funds for one’s birthday, here are just 7 scenarios where your cheque book is likely to come in handy. Collecting rent by cheque is the method of payment preferred by most landlords. Aside from being convenient for both the tenant and the landlord, it’s easier for the latter to prove payment was late by the post mark or date written on the cheque. 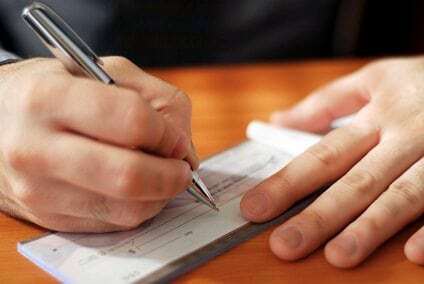 Cheque can also be post-dated, which eliminates the hassle of having to collect funds every month. After a night on the town with your significant other, it’s time to pay the babysitter. Unfortunately, you used the last bit of cash to pay for a cab home – oh no! Your childcare provider isn’t a walking ATM, nor would they be too thrilled to go home with an ‘IOU’ after a long night of chasing your little rug rats. Rather than panic or go running for a bank machine, just dig out that trusty old cheque book from your drawer. Yes, some grocery stories still allow customers to write cheque, which can be quite convenient if you’re opposed to using a bank card or credit. There’s nothing more terrifying than losing your cash while travelling. If you’re not feeling up to gambling with your hard-earned-money, a cheque is your safest bet. Writing a cheque sets up a paper trail – most banks keep a scan of each cheque on hand. This can be especially helpful in the event that a merchant claims they haven’t received payment. Yes – there’s the risk a thief could steal money from your account by forging a cheque, however “safety paper” makes it more difficult to do and easier to detect than ever before. For those who aren’t comfortable with online banking, paying the bills via cheque is the preferred method. Some companies may even let you post date your cheques so you don’t have to worry about remembering to send them each month. Have you ever driven by a garage or estate sale but decided not to stop because you didn’t have any cash on you? Think of all those great deals you may have missed! A cheque book could have been your ticket to happy treasure hunting. With these 7 scenarios in mind, perhaps it’s time to dust off your old cheque book and keep it close at hand.